If the signal dies, so does she. Suspense is on the line! After getting a frantic call on his cell phone from a kidnapped woman, a young man must battle his way through a ruthless world of lies and murder to rescue her. A fast-paced thriller in the vein of Phone Booth and Speed that will keep you riveted with edge-of-your-seat car chase scenes. $10.100 million on 2749 screens. 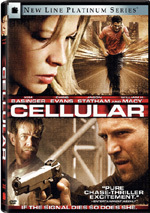 For a thriller with a modern technological twist, we go to 2004’s Cellular. At the start of the movie, thugs kidnap high school science teacher Jessica Martin (Kim Basinger). After they stick her in an attic, she manages to make a smashed-up phone work well enough to place one phone call. Before that action occurs, we see young hunk Ryan (Chris Evans) as he wanders the beach with his friend Chad (Eric Christian Olsen). Ryan can’t get over his breakup with Chloe (Jessica Biel) so he pretends to be interested in helping a cause to regain her affection. When Ryan goes to pick up some T-shirts, he receives the call from Jessica. He doesn’t believe her story but eventually agrees to take the phone to the cops. There Ryan tries to pass the phone to soon-to-retire Sgt. Bob Mooney (William H. Macy) but he gets stuck with it again when a disturbance develops in the precinct. Back in the attic, main thug Ethan (Jason Statham) threatens Jessica because they want to know what her husband did with some unmentioned item. She’s unaware of this issue, so she can’t help. Ethan doesn’t believe her, so he and the others go to kidnap her son Ricky (Adam Taylor Gordon). 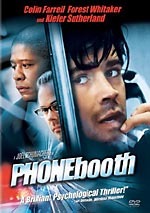 Various problems ensure that Ryan can’t deliver the phone to a cop and he remains stuck with it. The rest of the movie follows his attempts to keep Jessica on the line and help her escape the thugs. We also see Mooney’s persistence as well as a mix of twists. Essentially Cellular is a Hitchcock movie with a modern technological bent. Obviously the cell phone plays a major role in the proceedings, and it acts as the film’s most novel element. Otherwise the flick follows most of the expected paths. Sure, it tosses in a few unexpected road bumps along the way, but there’s not much here that viewers won’t anticipate pretty easily. Which twists work the best? Mainly those connected to the object the thugs pursue. We expect it to be money, drugs, or some other item of monetary value, but that isn’t the case. I won’t reveal what it is they want, but I will say it surprised me. Unfortunately, when we learn what it is, it creates a number of questions that require the suspension of disbelief, as it makes no sense that Jessica’s husband Craig (Richard Burgi) treated the object the way he did. Not that this is the only part of the movie that stretches credulity. Actually, “stretch” is too mild a term. Cellular doesn’t ask you to suspend disbelief - to enjoy the movie, you must smash and pulverize disbelief and never acknowledge the possibility that the film takes place in a world even remotely connected to reality. Oh, Cellular looks like the real world, but boy does it push the limits of what makes sense. From start to finish, it uses a variety of devices to make the story work. These vary from mildly unrealistic to wildly nuts. They include amazing coincidences - good thing Jessica was a science teacher who could hotwire a phone! - and total absurdities. Really, would it be so tough for Ryan to find someone in authority to take over the phone? Probably not, but if he gets rid of the phone, there’s no movie. 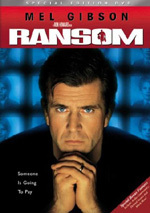 Actually, one of the film’s flaws connects to the involvement of Mooney, the one cop who pays attention to Ryan. I think the flick might’ve been more interesting without the use of the Mooney character. If Ryan was totally on his own, the story could have forced him to act with more ingenuity. As it stood, we knew that eventually Mooney would do something to save the day. This alleviated some of the tale’s tension and meant that Ryan didn’t have to be as clever as we might like. Although the story comes from the Hitchcock template, I think Cellular uses Speed as its main inspiration. The two films exhibit a lot of similarities, as this one often comes across as little more than Speed with a cell phone. This stems more from the feel of the two flicks and their tone than anything else, but I consistently thought of the Keanu Reeves flick as I watched this one. Too bad Cellular isn’t nearly as good as its apparent inspiration. 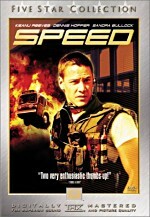 It lacks the charm and visceral action of Speed, and it also uses too much humor to alleviate the tension. We need some of that, as a totally aggressive movie would wear out the viewer. However, Cellular pushes too many of the light moments on us and they leave much of the movie without bite. Some of the funny bits succeed, such as the car chase in which Ryan drives the crappy econobox, but those also integrate anxiety. Too often, the film undercuts drama or action with inane humor that does nothing other than muddle the tone. At its heart, Cellular features an intriguing concept and the skeleton of a good thriller. There was a lot that could have been done with the story, and the movie occasionally provides signs of life. Unfortunately, it relies on far too many artificial devices to sustain its tale, and it also doesn’t deliver a consistently exciting or interesting experience. It’s a watchable but frustrating flick. Cellular appears in an aspect ratio of approximately 2.35:1 on this single-sided, double-layered DVD; the image has been enhanced for 16X9 televisions. No significant issues arose during this excellent transfer. From start to finish, sharpness looked excellent. Never did I notice any signs of softness or fuzziness. The movie came across as nicely detailed and well-defined at all times. Jagged edges and shimmering created no concerns, and I also saw no signs of edge enhancement. As one might expect from a recent movie, the film lacked source flaws. I didn’t detect any grit, specks, grain or other issues. Unlike many films in this genre, Cellular didn’t use a stylized palette. Instead, it presented natural colors that were well rendered. The movie consistently demonstrated lively and vivid tones. Blacks also were rich and firm, while low-light shots - primarily seen in the attic with Jessica - looked smooth and concise. All in all, this was a solid image. I also found a lot to like form the Dolby Digital 5.1 soundtrack of Cellular. With all the action pieces, the movie presented a lot of nice opportunities for vivid audio, and it followed up on them well. Most of these stemmed from car chases, as those offered a lot of convincing movement and used all the speakers very well. Environmental elements also created a fine sense of place, and the entire track utilized the five channels to solid effect. Audio quality also worked well. Speech sounded crisp and distinctive, with no signs of edginess or concerns connected to intelligibility. Music was bright and dynamic, as the mix replicated the score with good clarity. Effects also fared well. Those elements were lively and dynamic, and they showed no distortion or other problems. Bass response was very good. Low-end demonstrated tight, impressive tones. Overall, this was a solid soundtrack. A nice set of supplements rounds out the disc. We open with an audio commentary from director David R. Ellis, assistant stunt coordinator/director’s sister Annie Ellis, and producer/director’s daughter Tawny Ellis plus various guests. Most of the track puts the three Ellises together for a running, screen-specific piece. Periodically the commentary branches out for the guests. Ellis calls each and chats with them on the phone for a few minutes. Clearly they recorded these segments separately and dropped them into the running discussion. We hear from New Line president Bob Shaye, producer Lauren Lloyd, co-writer Chris Morgan, actor Chris Evans, stunt coordinator Freddie Hice, editor Daryl Sears, and composer John Ottman. The commentary never becomes great, but it usually stays interesting. We learn about the film’s development and changes made from the original plan in regard to the tale’s setting, its characters, and its path. We also hear about casting, stunts and effects, locations, test screenings and general production anecdotes. Since all three participants are related, they tell us a little about working together and their interest in the industry. As for the inserted phone chats, they vary in quality. Some are pretty superficial, such as the one with Shaye, whereas others offer a little more insight. I don’t think many of them provide a lot of useful material, though. They’re too short to go much of anywhere, although the conversations with editor Sears and composer Ottman are pretty good. I’m glad they fill in slots that otherwise probably would have turned into dead air, but they’re not especially valuable. Nonetheless, this remains a reasonably likable and informative piece. In the Deleted/Alternate Scenes area, we locate five clips. Taken together, these last five minutes, 39 seconds. All of them take place at the beach, and mostly they address issues connected to Ryan’s friend Chad and the “Heal the Bay” benefit. The alternate ending tosses out a cutesy conclusion with Ryan’s girlfriend Chloe. They’re entirely superfluous and merited excision. In a nice touch, all of them come anamorphic 2.35:1 with Dolby Digital 5.1 sound. We can view the scenes with or without commentary from director Ellis. He gives us a little background about the snippets and mostly lets us know why they got the boot, though he fails to tell us this for the second one. The disc includes three separate documentaries. We start with the 19-minute Celling Out, which presents a look at the expanding role of portable communication. We find movie clips and comments from telecommunications engineers Joel Engel, Dr. Martin Cooper, technology journalist Xeni Jardin, clinical psychologist Don Kilhefner, co-screenwriter Larry Cohen, and telecommunications expert Ian MacRury. They discuss the development of cell phones and how the technology works, the growth of their popularity and their psychological impact, the ways they affect society, and probable changes in the future. “Celling” offers a surprisingly rich look at its subject. We get a real discussion of the positives and negatives of cell phones as the program digs into all sides of the topic. Since I hate cell phones - or the way they’ve come to mar society, at least - I most enjoyed the criticisms of the devices’ use, but I appreciated this insightful and entertaining piece. In Dialing Up Cellular, we get a 25-minute and 54-second program. It gives us a look at the movie’s creation with the usual roster of film snippets, behind the scenes elements, and interviews. We hear from David Ellis, Annie Ellis, Tawny Ellis, Cohen, Lloyd, Morgan, Hice, producer Dean Devlin, New Line executive VP-Production Richard Brenner, executive producer Doug Curtis, production designer Jaymes Hinkle, location sound recordist Arthur Rochester, and actors Kim Basinger, Chris Evans, Jason Statham and William H. Macy. They go into the development of the story, bringing Ellis onto the project, changing the location from Boston to LA, casting and working with the actors, the director’s methods, shooting in LA and connected location challenges, and stunts and driving scenes. At times “Dialing” veers into the realm of promotional fluff, but not with much frequency. The parts about the actors and director fall into that area the most prominently, but they also give us good notes about their work on the film. It’s good to see the nuts and bolts of shooting the driving sequences and other location issues, and the footage from the set helps. It’s a pretty good documentary that offers a brisk and informative examination of the film’s creation. Finally, we find the 26-minute and 58-second Code of Silence: Inside the Rampart Scandal, a look at incidents echoed in Cellular. This piece includes remarks from Los Angeles Times reporters Scott Glover and Matt Lait, former LA County deputy district attorney Richard Rosenthal, and attorney Kevin McKesson. The program looks at the deep level of corruption in the LAPD, particularly within a division called Rampart, and focuses on the actions of officer Rafael Perez. It’s a terrific overview of the sleaze involved and acts as a nice companion to the movie. In a thoughtful touch, the program starts with a warning that the show may act as a spoiler for parts of Cellular. “Silence” never directly discusses the film or reflects upon specific aspects of its story, but one can infer plot elements from it, so I appreciate the tone of caution and respect for viewers who might not want to have any foreknowledge of the movie’s story. In addition to the film’s trailer, an area called More from New Line presents some ads. We find promos for The Butterfly Effect, Highwaymen, After the Sunset, The Aviator and Blade: Trinity. User-friendly footnote: we get English and Spanish subtitles for the extras. Fitfully entertaining but ultimately frustrating, Cellular disappoints because it suffers from too many cheesy elements. Most thrillers require the suspension of disbelief, but this one stretches our limits. The DVD presents excellent picture and audio plus a very strong roster of extras. Fans of the flick will clearly feel pleased with this excellent release. As for others, it might make a decent popcorn flick rental, but I can’t advocate anything more than that.